This past 4th of July weekend, we were lucky enough to spend it in the Ozark National Scenic Riverways, at the campground at Round Spring. We had a few hours to spare that Friday afternoon, with our tent set up and an itching to get out to see something cool, so we headed over to Powder Mill to hike the 1.3 mile trail to Blue Spring. What we found there was something really remarkable to see, on the beginning of this holiday weekend. Head east on 106 for about 14 miles toward Ellington, MO, and turn right (south) on the road to the Powder Mill campground. Make a left into the parking area/campground just before the river access. The trailhead to the 1.3 mile Blue Spring Trail will be to your left, and is not really marked (from what I could see). The trail heads into the woods under the bluffs for a bit, and then comes out of the flood plain and heads along the north side of the Current River, allowing for some pretty scenery. It then turns back into the woods for a bit, eventually meeting up with the trail from the Blue Springs parking lot, which heads to the spring. OR…you can forego the trail, and just head another 2 miles down 106 to the gravel road which will take you to the Blue Spring parking lot. 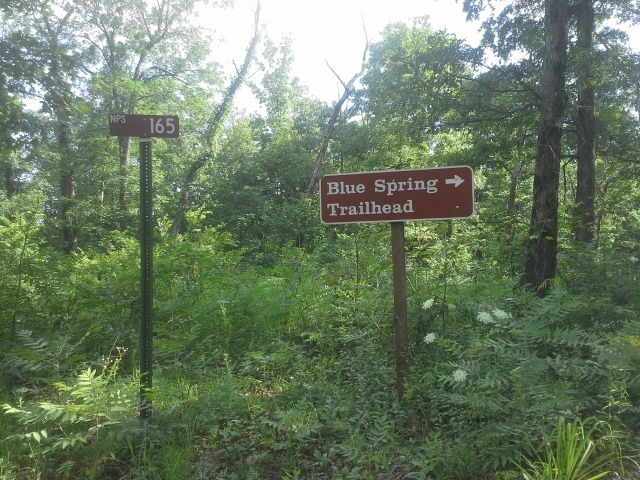 It is a right turn (south) off of 106, with signs for Blue Spring on the side of the highway. A little bit down the gravel road you make a right at the fork, and head down the hill and through the bottoms to the Blue Spring parking lot. Just a couple miles in total. The trail from the parking lot was pretty short, and you get to walk along the branch for Blue Spring, which eventually reveals itself, flowing silently out from under the rock face. 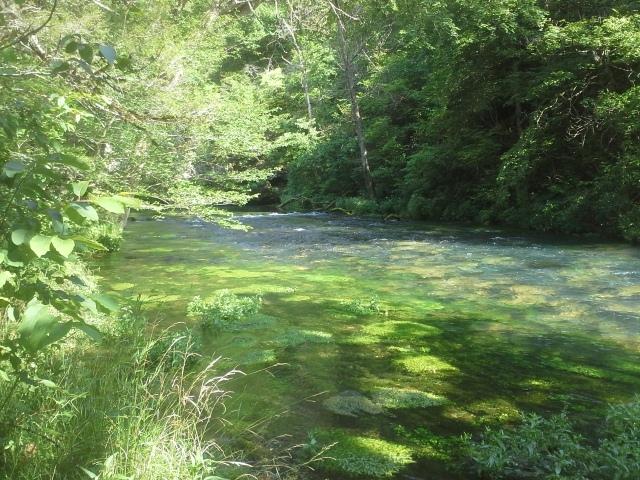 It is kind of a secret little magical place, hidden away in the forest, unlike some of the bigger and more popular springs in the Ozark National Scenic Riverways. 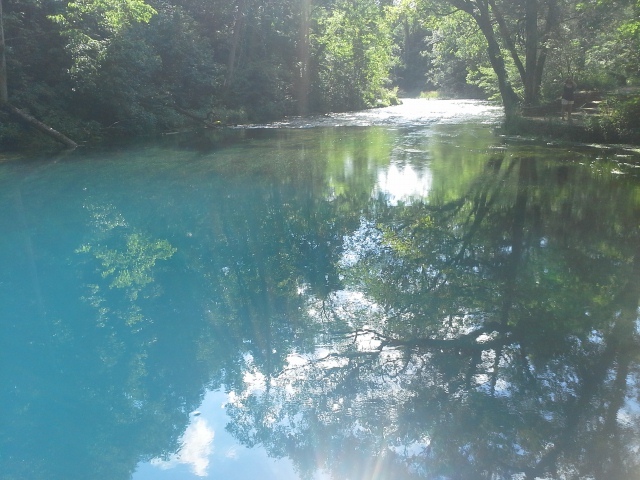 Blue Spring produces an average daily flow of 87 million gallons of water, and as well as being the deepest (300 feet), it also has some of the bluest color of all Missouri springs. It is considered to be part of the ONSR, but it is actually owned by the Missouri Department of Conservation, and lies within a designated 17 acre Missouri Natural Area. The fact that you can hike along the river to get there is nice if you’re feeling up for it. 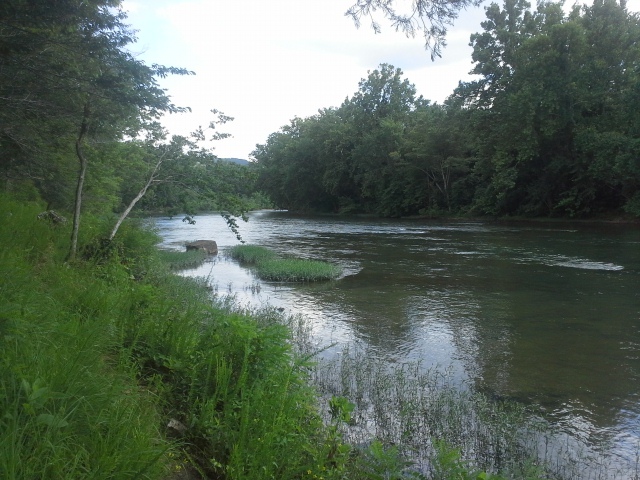 It gives you a chance to immerse yourself in the beauty of the area, especially hiking along the Current River. However, the fact that you can drive to the Blue Spring parking lot is nice to be able to do, in case you’re more inclined to focus on the relaxing aspects of your weekend excursions. The trail from Powder Mill isn’t very long, but I would consider it to be a moderate trail. Some of the sections are pretty narrow, either because of the lack of river bank, or the overgrowth along the sides. Towards the end, where the grasses and plants were leaning in pretty closely, there was some Poison Ivy, lurking around ankle height waiting to strike. The gravel road in isn’t one for the RV. The hill that you descend on the way in, and go back up on the way out, has a pretty respectable grade. And when we were going to try to visit back in April, there was a decent tree laying across the road right on that hill, blocking the way. Best to take a regular car if you’re going to drive into the parking lot. As with all springs, they support more specific plant and animal life, due to the content and temperature of the water. Please please please, out of respect to these beautiful and important places, fight the urge to get in the water. It is magical, but can be disruptive to the localized ecosystem. We had a weekend to spend exploring the amazing places within the Ozark National Scenic Riverways, and this was our first excursion. An afternoon hike along the Current River. 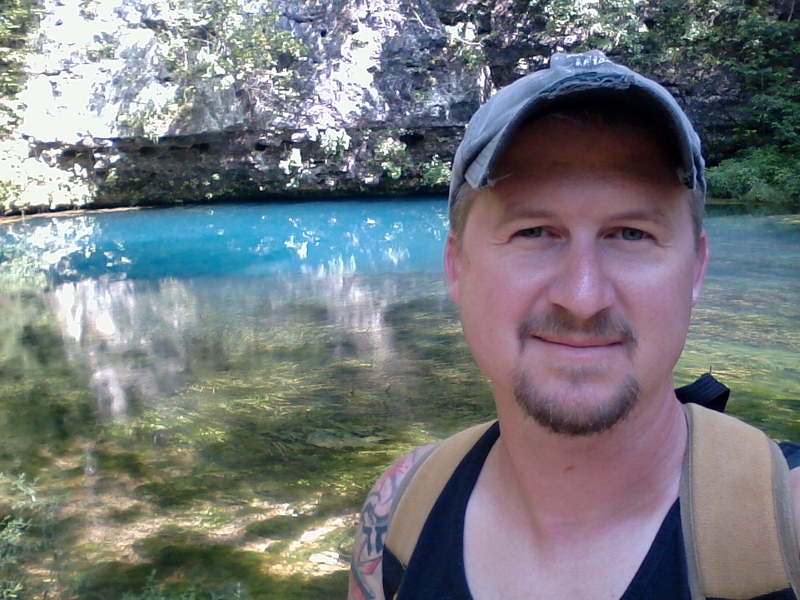 A few moments of peaceful observation of some of the deepest blue water I have ever seen. A conscious appreciation for this life giving substance, quietly and determinedly coming forth from the ground, to meet up with and add to the gorgeousness that is the Current River. 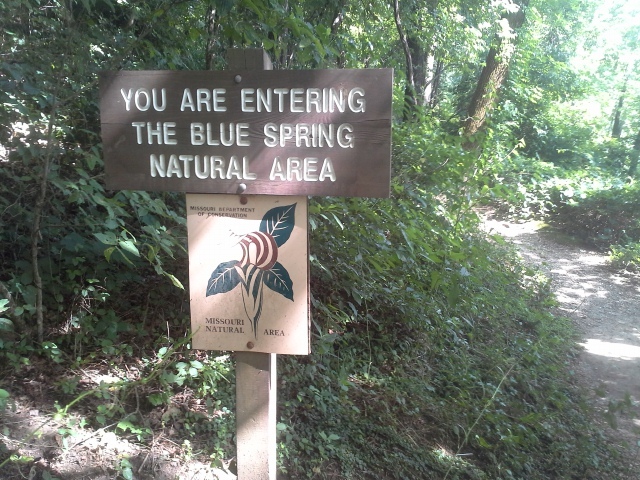 Blue Spring is a little place off the beaten path that is definitely worth the trip. 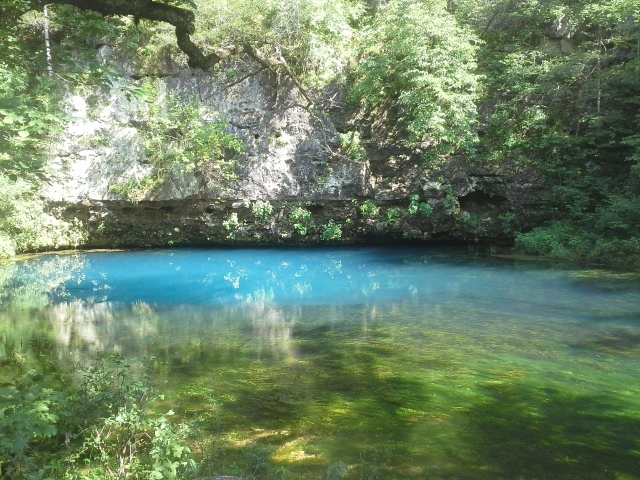 Make it a point to get there next time you visit the ONSR, to see one of the lessor frequented springs in the area. You will undoubtedly have a moment or two all to yourself there. Use that moment to give thanks for all the natural beauty that you have immersed yourself in. Blue Springs is closer to Ellington than Eminence. While we all share the location as an area to visit, it would be nice if Ellington was mentioned in your article as well. Thank You. Christy, I sincerely apologize for overlooking that detail. I will find a spot to mention that. Thanks for checking out the blog! The property designations are a little funny at first glance. The National Park Service does not own all of the land within the Ozark National Scenic Riverways. There are in-holdings in places that are private, state or federally owned. Land owners must follow certain guidelines for altering their property within the scenic riverway. I am sure there is a long list of restrictions. Not everyone adheres to the rules. That is why you see a few new cabins perched out over the river. This area of Missouri is one of the very best. A few moons back I took my younger son down this way. The challenge was to visit as many springs as possible in a weekend. 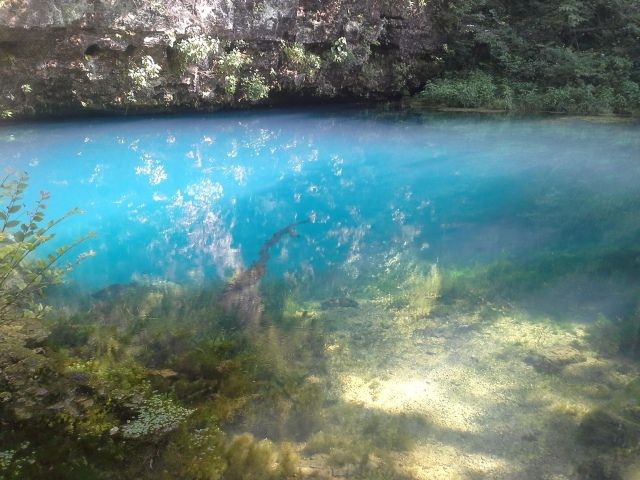 Blue Springs was among the ones we visited. It may be the most beautiful one. But each one we went too had its special feature or designation. If you’re up for hiking, camping and natural beauty (and who isn’t) travel down this way and see how many you can visit. There certainly is a lot to see in those parts!